Today, the former president and foreign minister, Lennart Meri, would’ve celebrated his 90th birthday; a Statesman with a capital S, he’s one of the founding fathers of the Estonian post-occupation success story, and one of the politicians in Estonia that everybody truly respected. My best friend celebrates his birthday on 29 March, the same day Lennart Meri was born. And on many occasions, when I call him on his birthday, I don’t say “happy birthday”. I say, “Happy Lennart Meri’s birthday”. That is the degree of respect we, the people whose formative years were during Meri’s presidency, have for him. One can’t have that degree of respect unless one’s a true mensch (Yiddish for “a person of integrity and honour”). In 1996, I sent the newly re-elected president Meri a congratulatory email. I sent it to the official email address of the president, truly expecting him never to see it. A day later, a reply came from lmeri@vpk.ee – the personal email address of the president. “Thank you so much for your good wishes,” it read. The man must’ve got thousands of emails every hour. And he took the time out of his schedule to actually write back to a young fan he didn’t know, because he cared enough. 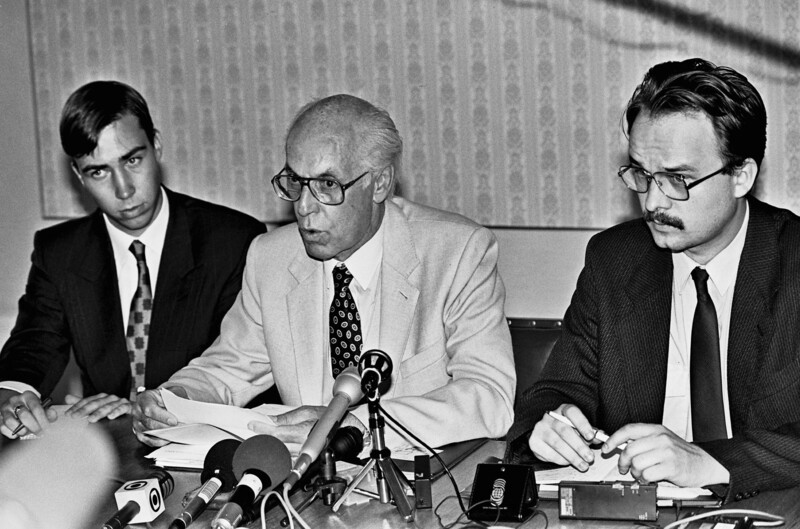 Having returned from Finland on the evening of 23 August 1991 to what was now the independent Republic of Estonia, foreign minister Lennart Meri is attending a press conference at the ministry of foreign affairs on Toompea Hill with Toivo Klaar and Tiit Pruuli. Photo by Peeter Langovits, from the archive of the foreign ministry. Yes, I am biased. I honestly admit I loved and admired the man. But so did hundreds of thousands of people in Estonia – and abroad. 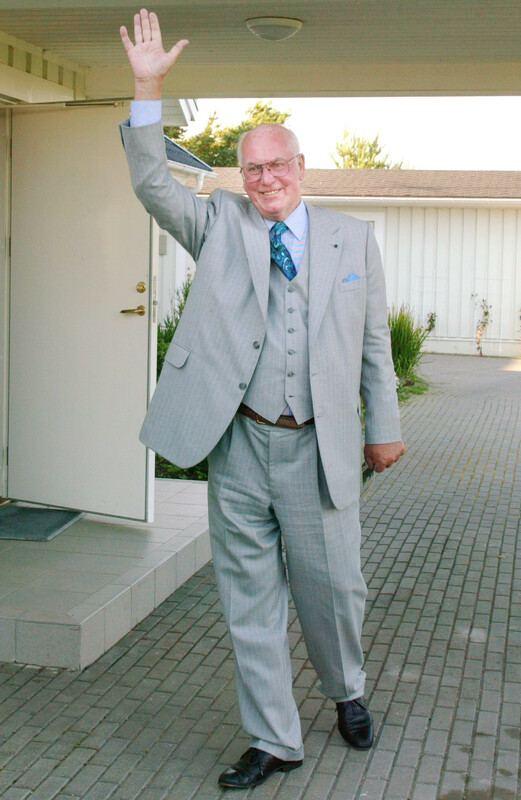 Perhaps to this day, Lennart Meri remains the most liked, the most respected politicians that post-occupation Estonia (and maybe the pre-occupation one, too) has ever had. Another aspect to Meri’s popularity was that he wasn’t a typical politician. He wasn’t constrained by party lines because he didn’t belong to one. He served as foreign minister in the government of Edgar Savisaar, the now-former leader of the centre-left Centre Party. But when he was elected president, he was the favoured candidate of the centre-right Pro Patria Alliance. He had broad support from both left and right-leaning people because he wasn’t a traditional politician. Most of his life, Lennart Meri was a writer and a filmmaker. He travelled extensively, and during the Soviet occupation, also beyond the Iron Curtain, and thanks to his diplomat father (Georg Meri was a diplomat in Estonia before the Soviet occupation), he had been educated abroad. He had studied in nine different schools in four different languages, and he was fluent in Estonian, English, German, Finnish and Russian. Already during the Soviet occupation, Meri attended the University of Tartu and got a degree in history. Unfortunately, due to the Soviet politics, he was unable to work as a historian, so he turned to arts to earn his living. 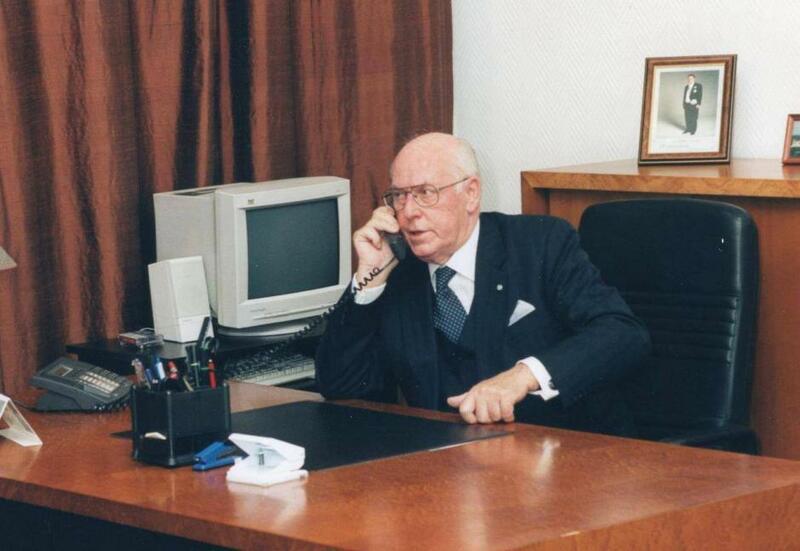 Lennart Meri on 13 September 2003. Photo by Peeter Langovits, the archive of the foreign ministry. In 1958, Meri published his first book, titled “Tracing Cobras and Karakurts”. It was a travel book about his trip to Central Asia. But he’s probably most famous for “Silver White”, in which Meri contemplated, using both science and fantasy, over the past of Estonians and other Baltic Sea nations. Many think that “Silver White” is one of the most masterful disquisitions about the past of Estonians. 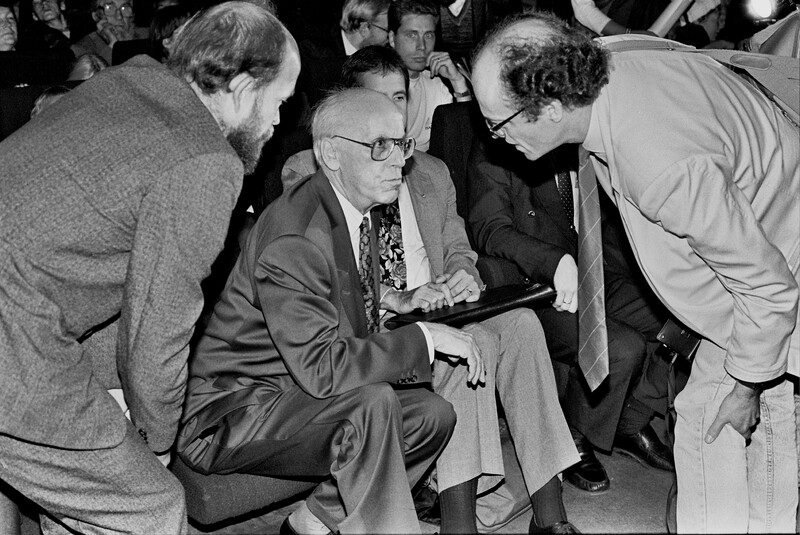 Lennart Meri, the politician, started to develop after he was finally allowed to travel beyond the Iron Curtain in the late 1970s. He started to establish close relations with politicians, journalists and Estonian expats and worked tirelessly to remind the free world of the existence of Estonia, and the fact that it was occupied by the Soviet Union. “I knew Lennart Meri from 1985. The beginning was very typical Lennart Meri-like, because I was in Finland, in Turku, and then someone set up a meeting between us in July of 1985. I drove from Turku to Helsinki or Espoo, where he was, and it was the worst rain storm ever, and he said, come at 11 or 12, so I got up in the morning. And, of course, Lennart Meri was not there. This was before mobile phones. So, I stood there at the front door of this house for an hour. Then he came an hour, hour-and-a-half later, laughing. And then he proceeded to smoke my Marlboros,” president Ilves remembers. In 1990, almost two years before the Soviet Union officially collapsed – but a few years after it already started to crumble from every corner – the then-leader of the Estonian government, Edgar Savisaar, invited Meri to become foreign minister. And thus, the former writer and filmmaker officially entered politics and was handed the enormous task of rebuilding Estonia’s foreign service, Estonia’s diplomacy. 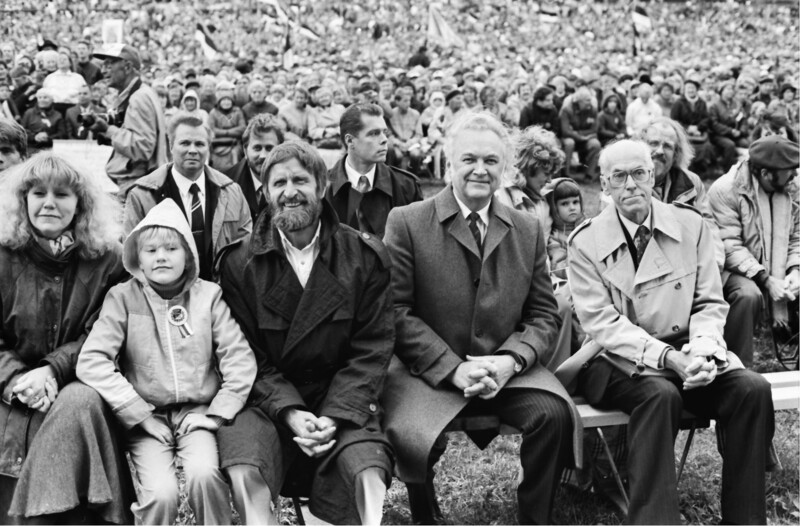 At the Song of Liberty, a mass event held at the Tallinn Song Festival Grounds, the front row includes foreign minister Lennart Meri with the chairman of the Supreme Council, Arnold Rüütel, and the family of artist and then-politician Heinz Valk. Photo by Peeter Langovits, from the archive of the foreign ministry. The last time Estonia had its own government and its own foreign service was in 1940. Fifty years of Soviet occupation had done its job and government-wise, there was almost nothing to rebuild on. The work had to start from the scratch. One of these bright young people who at the time went to work for the foreign ministry and has stayed there for the past 30 years is the current deputy chief of the Permanent Representation of Estonia to the EU, ambassador Clyde Kull. 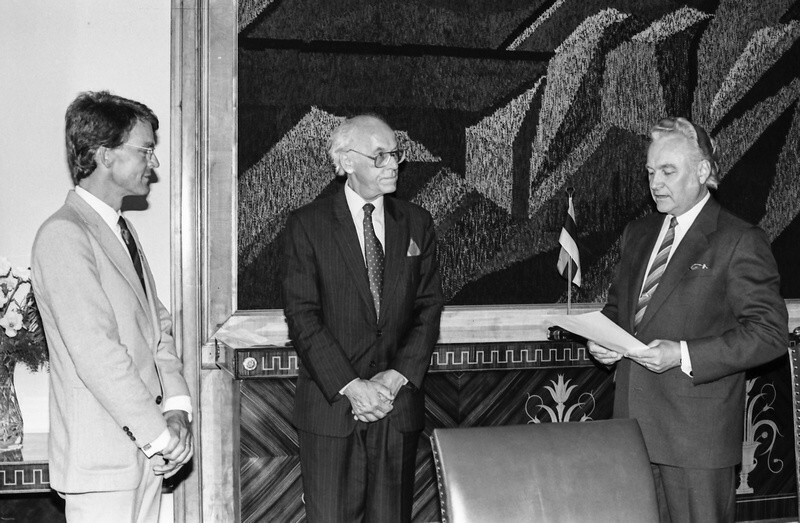 On 29 August 1991, the first ambassador to the again-independent Estonia, Lars Grundberg of Sweden (left), presents his credentials to Arnold Rüütel (right), the chairman of the Supreme Council. 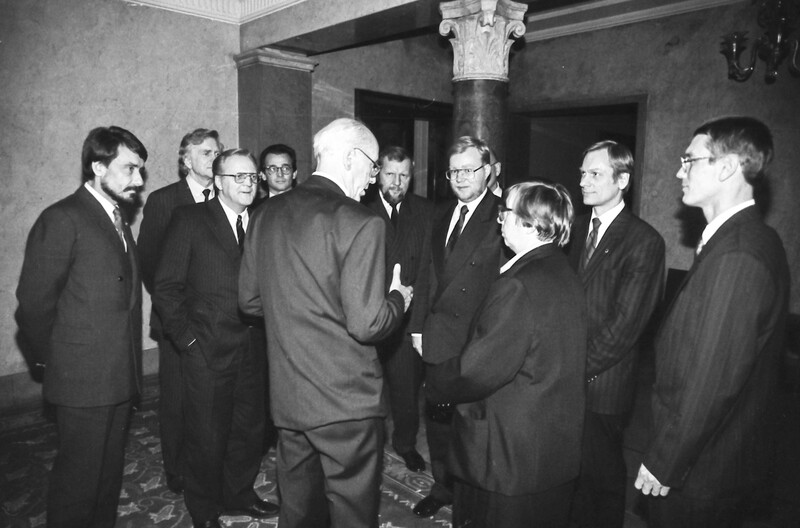 Foreign minister Lennart Meri in the middle. Photo by Peeter Langovits, foreign ministry archive. According to Kull, many people working at the foreign ministry at the time didn’t actually work for the ministry but were employed elsewhere – because of the lack of structure. They were technically employed elsewhere and got paid from elsewhere, even though they worked for the ministry. The foreign ministry employed its first advisors – Kull among them – only in March 1991, which was still half a year before the Soviet Union ceased to exist. France was the first major Western power to recognise Estonian, Latvian and Lithuanian independence. 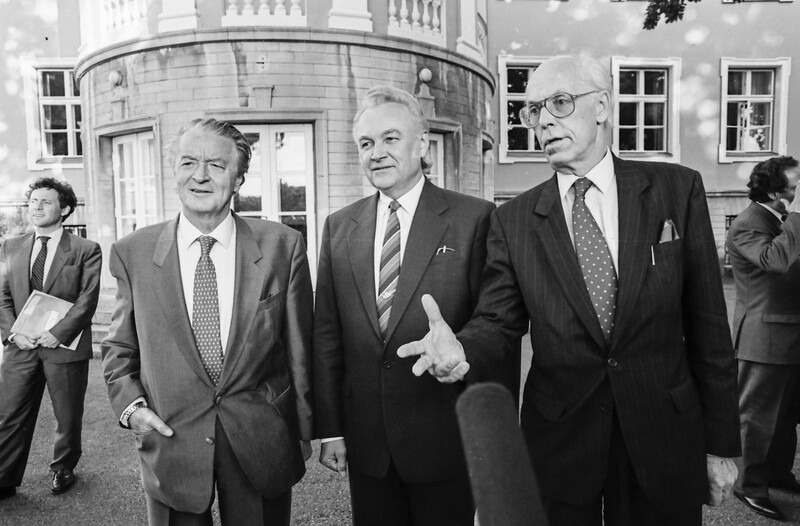 Just five days after recognition, French foreign minister Roland Dumas paid a visit to Estonia and was received in Kadriorg by the chairman of the Supreme Council, Arnold Rüütel, and foreign minister Lennart Meri. Photo by Peeter Langovits, from the archive of the foreign ministry. President Ilves says he considers the Estonian foreign service one of the best foreign services – if not the best – of a small country that he has ever seen. “Clearly you can’t compare it to the British Foreign Office, or the French, let alone the State Department in the US,” he explains. Even though in the first round of the presidential election, Rüütel had got 45% of the popular vote, the second round of the election was held in the parliament. On 5 October 1992, 59 of the 101 members of the Riigikogu supported Meri as president. He was sworn in the next day. To this day, the post-occupation Estonia has had four presidents, two of them former foreign ministers – the other one being Toomas Hendrik Ilves. Thus, I have to ask, is having been a foreign minister somewhat a perquisite for a successful presidency? Lennart Meri with supporters at the Tallinn Linnahall during his presidential election campaign. Photo by Peeter Langovits, from the archive of the foreign ministry. In 1996, during the second term of Lennart Meri’s presidency, Ilves accepted the position of foreign minister in the Estonian government. “I became foreign minister because he called me up and demanded that I move to Tallinn and become foreign minister. And then he called prime minister Tiit Vähi and said, make him foreign minister,” Ilves recalls. How about the disagreements? “We had disagreements over ambassadorial appointments, how long people should stay as ambassadors, because I was afraid of something called clientitis, which is that if you’re too long in one place, you begin to represent more the country you’re in rather than the country you’re from, so we had a big disagreement about that,” Ilves remembers. 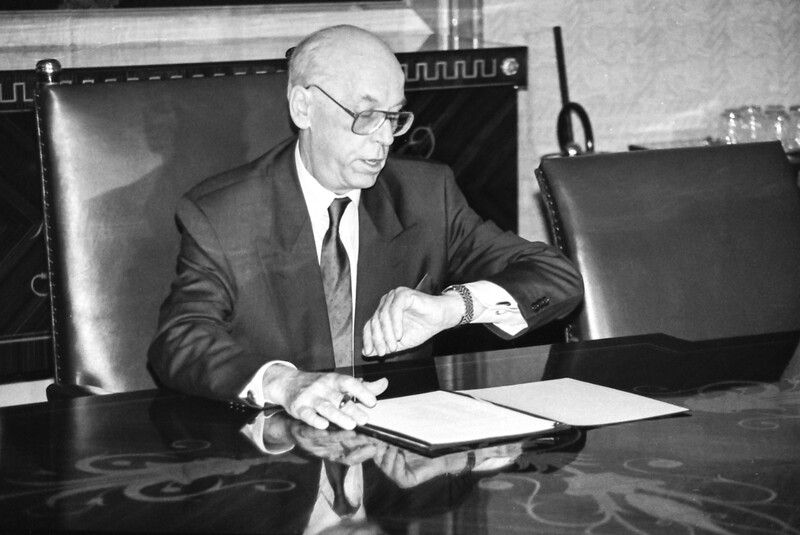 At 6:15 PM on 21 October 1992, President Lennart Meri issued Decree No. 1 from Kadriorg, appointing the first constitutional government of the Republic of Estonia after the restoration of national independence, with Mart Laar as prime minister. Photo by Peeter Langovits, from the archive of the foreign ministry. President Meri was the type of person who tended to call people one or two o’clock in the morning. “He had an interesting work style. He had a thirst for thoughts, ideas; he always had a starting point, he vaguely knew what he wanted to ask or get, but he needed input from others, and then he gathered these inputs during the night from everywhere, and by the morning, he was holding a pen, putting all that down on the paper along with his own thoughts,” Kull recalls. “The best example of this was when we were together on his first work visit as president, to Brussels. We had a meeting at NATO. It was the first time when a Central or Eastern European president came to give a speech in front of the NATO ambassadors. And we already were in the cabinet of Manfred Wörner, the then-secretary-general of NATO, with whom we had a small meeting before going to the hall. “This calm quality was very intrinsic for him, but it also characterises his work style,” Kull adds. After the appointment of Mart Laar’s government, its members and the president posed for a group photograph in the foyer of Kadriorg Palace. Photo by Peeter Langovits, from the archive of the foreign ministry. When Meri died in March 2006, I had been working as a journalist for eight years – five of them as a jack of all trades – an online journalist. Every emotion in my body had died by that time. Bad things happened all the time and when the said bad things happened, I usually sighed, worried about the fact that I had more work to do, that my weekend was ruined, that I couldn’t go out to drink that night because I had to work until 2AM. But the day Lennart Meri died, I cried. The TV was on in the office and they showed old videos of president Meri, and I was just standing there next to my desk, watching it, and I couldn’t help but well up. The emotions that I had suppressed all these years, they weren’t dead. I just needed a personal loss, a personal affection, to release them. Yes, the day Lennart Meri died, I cried. And so did many others. Cover: Lennart Meri at his cabinet (images courtesy of the Estonian Foreign Ministry and © Peeter Langovits, author of the exhibition, “Thinking of Lennart Meri”).